A private garages team carries out all service and repair work. This is a contribution to the safety and operation of our fleet. 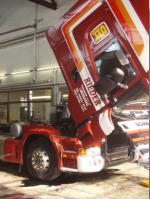 Our vehicles are noise and emissions and thus correspond fully with the international standards. 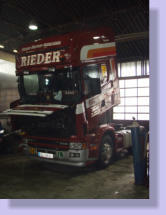 In addition, we operate a public truck and Buswerkstätte where other vehicles are serviced and repaired. We are partners of Scania workshop group. Repairs will be paid by the customer in cash or get regular customers one invoice at the end of the month.